The One Laptop Per Child (OLPC) program aims to provide each child in developing regions with a connected laptop to address the digital divide and to allow them “to become connected to each other, to the world and to a brighter future.” Uruguay, through its governmental project –Plan Ceibal– was the first country to achieve the ‘full deployment’ status, after successfully delivering a XO laptop to every public schooled child between 6 and 12 years old. Although Plan Ceibal explicitly includes children with disabilities, we found that children with motor impairments were not able to use the XO computers. The NEXO project (2011–2012) aimed at creating alternative and personalised interfaces to include users with motor disabilities. Interactive Narrative. A set of interactive stories with interfaces based on computer vision techniques that allowed users to explore narrative spaces. Tangible Interaction. MakeUY A XO-compatible version of the Makey Makey paired with simple video games that offered an easy entry to the XO world. Flexible Interaction. NEXO's most powerful idea was to address the significant differences between its target population creating flexible paradigm where teachers could modify and adapt the interfaces to the different needs of each user. We created periscopes that allowed the XO's webcam to see the space in front of the keyboard. Our OpenCV-based system was then able to use that space as an effective interaction area and teachers could design and print custom-made paper-based tangible interfaces. The project also aimed at evaluating the impact that incorporating these new technologies would have in the psycho-motor development of motor-impaired children. Although very preliminary, the project results showed encouraging results. Within NEXO, we created a database of clinic evaluations of 24 children, as well as 22 reports created by students of UDELAR's Psychology School. NEXO was a research project of the Laboratorio de Medios at UDELAR, in collaboration with UDELAR's Center for Basic Psychology Research. The research team comprised Tomas Laurenzo (PI), Gustavo Armagno, Ana Martín and Cristina Palás. Related research is being carried on by Armagno as part of his MSc work. A. Martín, G. Armagno. T. Laurenzo. An interdisciplinary education space for tackling accessibility problems of the One Laptop Per Child program (in Spanish). Journal Unam.MX. Mexico City, Mexico. 2012. T. Laurenzo, G. Armagno. 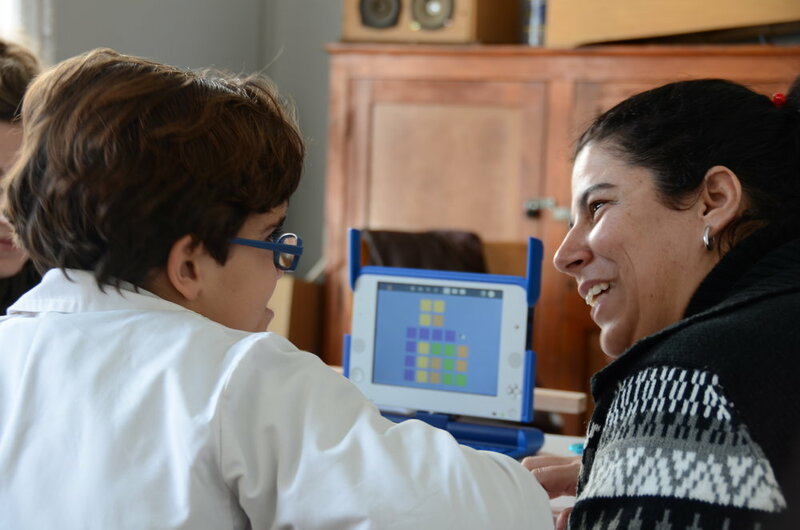 Building Accessibility Stories: Enabling Multi-Sensory Experiences within the OLPC program in Uruguay. Proceedings of the International Symposium on Electronic Art, ISEA 2011, Istanbul, Turkey. T. Laurenzo, G. Armagno. Accessibility and Education (in Spanish). IV Forum on Innovation on Higher education. UDELAR, Montevideo, Uruguay, 2010. G. Armagno, M. Bonilla, S. Marichal, T. Laurenzo. Designing interfaces for children with motor impairments: An ethnographic approach. Proceedings of the XXIX International Conference of the Chilean Computer Society, SCCC 2010, Santiago de Chile, Chile.